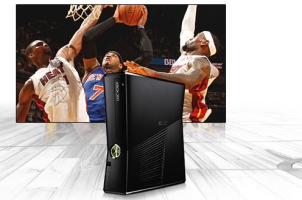 The Xbox 360 has added yet another streaming sports service to its repertoire with the introduction this week of the NBA Game Time app. With the Game Time app, folks who subscribe to both Xbox Live Gold and NBA League Pass Broadband will be able stream regular season NBA games through their Xbox, complete with integrated Kinect-powered voice and gesture controls. The app and service allow for streaming at 720p. There are two levels of NBA League Pass Broadband. The $199.99 “Choice” package provides live streaming and on-demand archives for 5 teams, whereas the $179.99 “Premium” package provides complete access to any regular season game for all 30 teams. You’ll be able to watch live games, highlights and replays in HD, set a specific favorite team to follow and monitor team schedules and stats all through the app. Game Time also features the ability to watch up to two games at once, or watch a live game and catch up on highlights in a split-screen view.